The Palestinian Authority (PA) on Monday asked the UN to investigate "extrajudicial killings" by Israel, in the wake of an incident in Hevron last Thursday in which an IDF soldier shot a wounded Arab terrorist. The soldier has been jailed and accused of murder for shooting the terrorist, who minutes earlier together with an accomplice stabbed and wounded a soldier. The soldier has argued he shot the terrorist over concerns he was about to detonate a bomb belt that was thought to be hidden under his unseasonable coat. 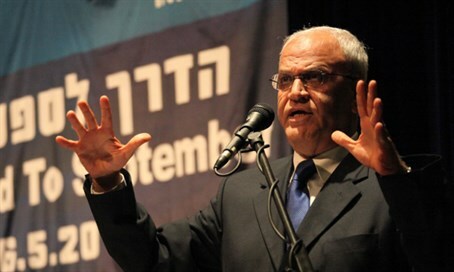 PA chief negotiator Saeb Erekat said Monday that Israeli investigations in the past did not "serve justice," and he claimed Israel has been "rewarded with impunity," reports the Associated Press. During the recent wave of Arab terror attacks since last September, which has claimed the lives of 34 victims, the PA has consistently accused Israel of "extrajudicial killings," condemning the way Israeli civilians and security forces defend their lives by shooting attacking Arab terrorists. In response to the incident last Thursday, Israeli officials including Prime Minister Binyamin Netanyahu rushed to condemn the soldier. Shortly afterwards the UN condemned the "gruesome" killing and demanded "justice" for the terrorist.